Power Translator is an accurate, fast, flexible translation package that meets the needs of individuals to communicate with family and friends, and is great for students. With Power Translator you can translate letters, emails, chats, and blogs, and translate from any program effortlessly. Power Translator comes in bilingual versions (Personal, Pro) and multilingual versions (Premium, Euro, World, World Premium). Power Translator is an accurate, fast, flexible translation package that meets the needs of individuals to communicate with family and friends, and is great for students. With Power Translator you can translate letters, emails, chats, and blogs, and translate from any program effortlessly. Power Translator comes in bilingual versions(Personal, Pro) and multilingual versions (Premium, Euro, World, World Premium). Power Translator Premium is an economical way to translate multiple languages - translate to and from English, French, German, Italian, Portuguese, Russian, and Spanish. 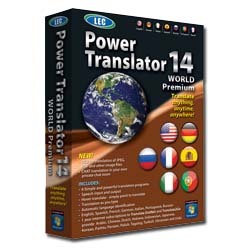 Power Translator Personal is LEC's most economical bilingual desktop software. It meets the needs of individuals to communicate with family and friends. Great for students. Power Translator Personal comes in versions for specific language pairs: French<>English, French<>German, German<>English, Italian<>English, Italian<>German, Portuguese<>English, or Spanish<>English. Power Translator Pro helps grow businesses by providing more access to technical subjects and business documents. It is the most advanced version of LEC's economical bilingual desktop software. Pro versions provide bidirectional translation between English and one other language (either Spanish, Portuguese, French, German, or Italian). Power Translator Euro is a multilingual version of LEC's most economical desktop software, and provides multilingual translations to and from English, French, German, Italian, Portuguese, Russian and Spanish. Power Translator Euro is a multilingual version of LEC's most economical desktop software, and translates to and from 13 languages: English, Chinese, Dutch, French, German, Italian, Japanese, Korean, Polish, Portuguese, Spanish, Russian. and Ukrainian.